The world's longest sea bridge, an engineering feat almost a decade in the making, was officially declared open on Tuesday by Chinese President Xi Jinping. 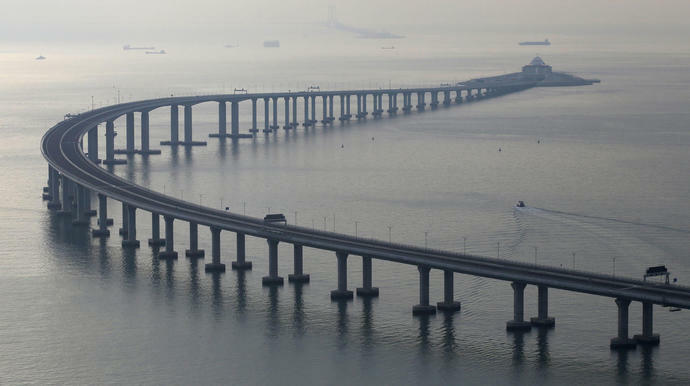 The 34-mile bridge connects the semi-autonomous regions of Hong Kong and Macau to the Chinese mainland city of Zhuhai. Officials say it will cut travel time between the three cities from several hours to about 30 minutes. Costing about $20 billion to construct, the bridge was built to withstand a magnitude-8 earthquake, a super typhoon and super-sized cargo vessel collisions, CNN reported. It's also been described as one of the world's most unusual roadways, reportedly boasting special features like yawn-detecting cameras and blood pressure-monitoring machines. For all the official fanfare, however, the bridge, which will be open to traffic on Wednesday, has not been without controversy. According to the BBC, several workers died during the construction of the sea-crossing roadway, prompting local media to dub it the "bridge of death." Conservationists have warned that the structure poses a threat to local marine life, such as the Chinese white dolphin. And the bridge has been condemned by critics of the Chinese government as a political tool being wielded by Beijing to impose greater control over Hong Kong. People in Hong Kong have also complained about requiring special permits to cross the bridge. Most drivers will have to park their own cars after getting through immigration and switch to shuttle buses or private hire cars to get across the bridge, CNN reported. "Hong Kong has had to fund a lot of the bridge [with taxpayer dollars], but we won't see many benefits here," Claudia Mo, a Hong Kong lawmaker who has called the bridge "a waste of money," told the outlet.